(Wilmington, DE) March 30, 2016 – College Ave Student Loans, a leading online marketplace lender of private student loans, today announced the launch of its parent loan, a new choice and competitive alternative to existing federal and private loans for parents who are helping their children pay for higher education. The College Ave Student Loans Parent Loan has no origination fee and a lower fixed interest rate than the Federal Direct Parent PLUS loan, which means credit-qualified parents could save nearly $1,000± on the average loan with College Ave Student Loans over the federal option. 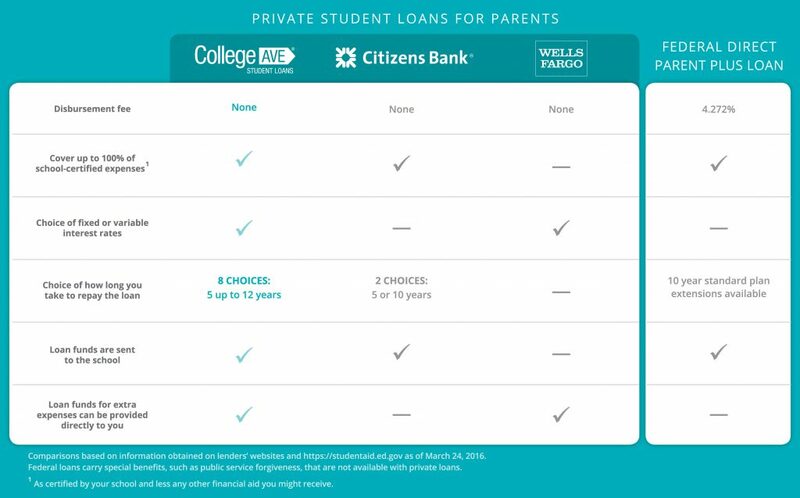 In addition, the College Ave Parent Loan offers parents greater flexibility and personalization to fit their individual financial situations when compared to other private lenders. This includes the option to have up to $2,500 deposited directly into parents’ bank accounts so they control the spending for extra education expenses like books, electronics, dorm supplies and more. Parents also have the choice to start paying in full right away, or to limit monthly payments while the student is in school, and to pick their own repayment term from 5 to 12 years. The College Ave Parent Loan has no origination fees and low interest rates. With a fixed rate of 6.35% APR and variable rates of 4.03%-6.03% APR (all rates shown include auto-pay discount) for qualified borrowers, the College Ave Parent Loan offers parents a competitive alternative to existing loans. Loans start at $2,000 and can cover up to 100% of the school-certified cost of attendance. Parents will be able to apply for this new loan as of April 20, 2016. To better support parents who may want to consider borrowing themselves or cosigning a private student loan, College Ave Student Loans is collaborating with Experian®, a leading global information services company, to offer a complimentary credit education session with an Experian Credit EducatorSM agent. During the in-depth, one-on-one, 35-minute phone call with an Experian Credit Educator agent, parents will receive a copy of their Experian credit report and score, a personalized, step-by-step walk-through of the report, as well as examples of actions that may improve their credit score and insights for future credit management decisions. For more information about how to access the free credit education session, visit www.collegeavestudentloans.com/crediteducator. At College Ave Student Loans, we learned from other complicated lending companies and decided to make getting a private student loan for college better. As an online marketplace lender with a sole focus on private student loans, we’re using technology and our deep industry expertise to connect families who need to cover education costs with lenders who can provide that funding. By specializing in student loans, we are able to give our customers the attention they deserve and deliver loans that are simple, clear, and personalized for the individual. Competitive rates, the most repayment options, and a customer-friendly experience from application through repayment. For more information, visit: www.collegeavestudentloans.com. ±Calculations are estimates only. According to The College Board’s “Trends in Student Aid 2015” annual report, in 2014-15, parents of 716,000 dependent undergraduate college students borrowed $10.6 billion from the Parent PLUS program, at an average of $14,750 per loan. Calculations assume a parent borrower takes out a loan for $14,750 (before fees), has one loan disbursement, and uses a 10-year standard repayment plan. Calculations are as of 3/24/2016 based on Direct PLUS Loan information available on https://studentaid.ed.gov including a 6.84% interest rate and 4.272% loan fee, vs. a College Ave Student Loans Parent Loan with a 6.75% interest rate and no loan fee.